The APWA Young Professionals Group will host a joint event with American Water Works Association (AWWA) Young Professionals on August 27 at Canterbury Park in Shakopee. Thursdays are Buck Nights at Canterbury, so come enjoy $1 entry along with discounted food and drink specials. 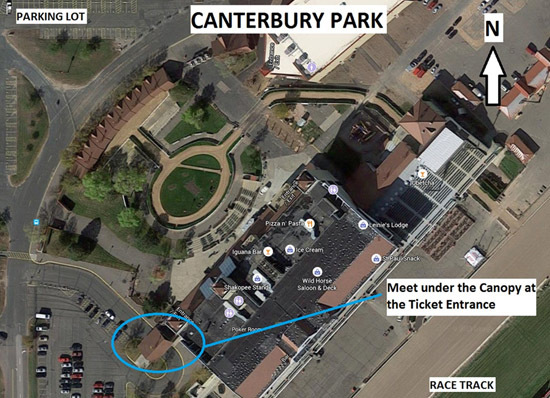 We will meet at the ticketing office outside the race track at 6 pm, first race is at 6:30 (see map below). This will be a fun opportunity to mingle with members of another professional organization while enjoying some exciting horse racing action! The Young Professionals Group would also like to welcome our newest sub-committee member, Alex Jordan from the City of Lakeville, who will be hosting this event. Please RSVP to Alex at ajordan@lakevillemn.gov if you plan to attend.